We are constantly innovating and seeking new ways to create impact through the tours and journeys we organize. Creating meaningful journeys that touch hearts by sharing stories and ideas with compassion and love is our happiness and this is what brings us the biggest joy. In this pursuit, we always foster and try to implement activities in our itinerary to engage our clients in meaningful activities, regardless of the magnitude of effect it has. Be it a short visit to a rural village and donating a book to a school library to engaging and living with the locals for days. With our dedication “to create meaningful journeys that renders to self-discovery and exploration of the senses, mind and the heart for understanding, peace and prosperity” we are passionate and work hard towards conscious traveling and journeys. As an impact travel company we see ourselves as a ‘bridge’ – to connect, facilitate, empower and provide a platform between individuals and organizations to be their best selves through collaboration and partnerships. In doing so, we nurture such relationships to the extent possible. The following are some impact journeys of our partners that we are proud to facilitate and be part of. 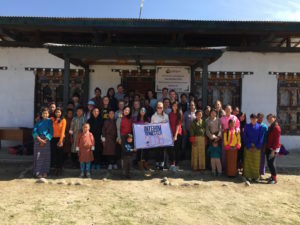 READ Bhutan is an NGO that works with rural communities to build and establish community library and resource centers, to empower and inspire education, economic and community development. Singapore American School (SAS) is known for an unmistakable culture of excellence, extraordinary care, and possibilities. SAS takes their high school students on Interim, which runs for a week. Interim Semester is a required off-campus experience designed to enhance the curriculum by providing high school students with diverse educational experiences beyond the traditional classroom. The East-West Center Arts Program held an exhibition on Bhutan titled “Bhutan: Gross National Happiness” from February 25 to May 27, 2018. In partnership with Vendetti Productions and Wehrheim Productions of Hawaii, Bhutan Tours and Travels worked as the logistics partner and cultural consultant to film, produce and launch the Emmy Award winning 1 hour long documentary. With an 8-film crew supported by local Bhutanese, the onsite filming and interview was a 2-week long journey and adventure. In the eight-member film crew was also world famous jazz flautist and saxophonist Paul Horn, so we had to organize a music concert for the Bhutanese crowd. It was success and well received. The film went on to win 2 Emmy Awards and is aired on PBS in America and Bhutan Broadcasting Service TV.